Eagle Superabrasives Inc. is a premier supplier of super abrasives supplies in the United States. With an extensive inventory of over 6,000 diamond and CBN wheels in stock at our Hickory, NC location we are usually able to ship ninety-percent of orders in the same-day. Customer orders can be shipped in as little as seven days. On occasion diamond and cbn has to be conditioned. The conditioning of Diamond and CBN can be divided up into the process of dressing, profiling and sharpening. Dressing a wheel is typically done when the bond type is that of vitrified. Dressing wheels produces the concentricity, flatness and geometrical accuracy. Just as conventional wheels, Diamond Wheels and CBN Wheels can use the same dressing tools such as blade-type, multipoint or single point diamond or diamond roll. By maintaining a good dressing, the tool can maintain a consistently good result and enhance the tools life. The profiling process eliminates geometric deformities and gives the grinding wheel the required shape. When profiling CBN grinding wheels, a diamond profiling wheel is used. The diamonds cut CBN grit and the bond to create a smooth wheel. 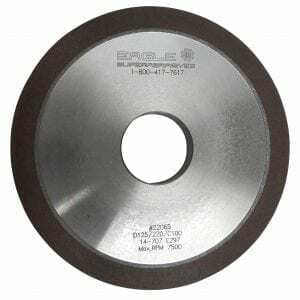 Profiling diamond grinding wheels is economically efficient in special cases. Resin bond and Hybrid Diamond Grinding tools are usually dressed with silicon carbide. When you’re ready to try the best or have questions regarding dressing, profiling or sharpening wheels, trust the experts at Eagle Superabrasives. Our experienced staff will provide support and advice along the way. With unparalleled customer service, superior products and fast shipping, Eagle Superabrasives is an easy choice for all your grinding needs. Contact us today to place an order!